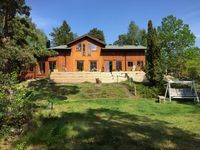 Newly renovated house Stockholm & archipelago - 200 meters to lake. Property 61: Newly renovated house Stockholm & archipelago - 200 meters to lake. Sea cottage on jetty in sunny location, 18 km fm Stockholm. Rowingboat included! Property 66: Sea cottage on jetty in sunny location, 18 km fm Stockholm. Rowingboat included! 95 meters to the sea and archipelago. Boat with 4 hp (new 2019) included. Property 68: 95 meters to the sea and archipelago. Boat with 4 hp (new 2019) included. Close to Stockholm, outdoor pool and sea. Property 94: Close to Stockholm, outdoor pool and sea. Great location in the middle of the historic old town. Malenas Haus liegt mitten in der Natur an einem malerischen See. Trotzdem erreicht man Stockholm mit Bus oder Auto bequem in 25 Minuten. Die K&uuml;che, die drei Badezimmer und die Schlafzimmer sind top ausger&uuml;stet. Wohnzimmer und Veranda einfach &uuml;berw&auml;ltigend. Schwimmen und Kanu fahren sind abendliche Favoriten. Wir waren f&uuml;nf Erwachsene und es war uns immer sehr wohl.